Parvathy Baul (b. 1976) is an accomplished singer, teacher, instrumentalist, and practitioner in the Baul tradition of Bengal (India and Bangladesh). She has performed in over forty countries, led several workshops, published a book on the Baul tradition, and recorded five CDs. As a teacher, she carries on the lineage of Sanatan Das Baul and Shashanko Goshai, teaching the philosophy and music tradition that emphasizes respect and unity of all human beings. She is also a storyteller and visual artist. In 2005, the Baul tradition was included in the list of “Masterpieces of the Oral and Intangible Heritage of Humanity” by UNESCO. Interview by Lisa Knight. Lisa Knight is Professor of Religion, Asian Studies, and Anthropology and Chair of the Department of Asian Studies at Furman University in South Carolina. I sat with Parvathy Baul on the hotel bed in Madison, Wisconsin, the morning after she gave a mesmerizing performance for an audience at the Annual Conference on South Asia. I would not have believed that we had known each other for 16 years except that her hair had grown into much longer locks that now cascaded all the way to the floor, circling her as she danced on stage. The first time I met Parvathy was in 2002 when she came to perform at the University of Chicago. 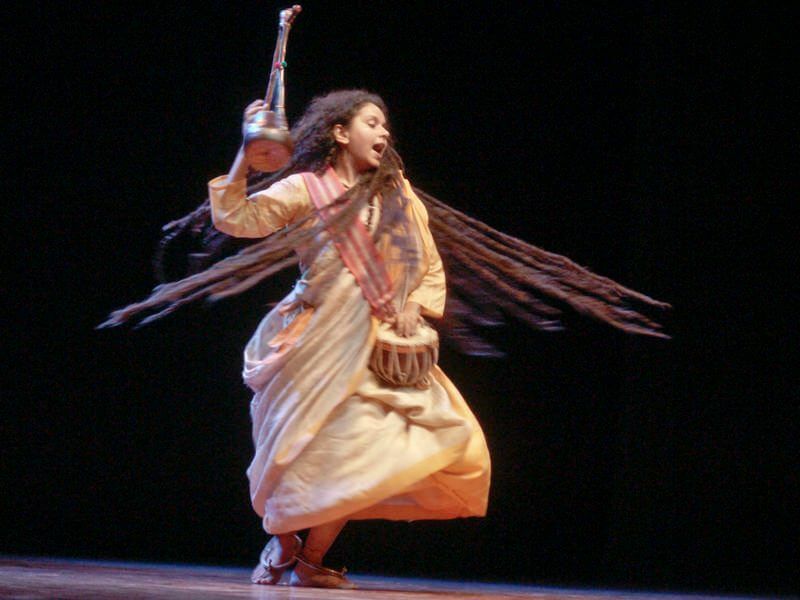 Parvathy came with a group called Vastuvadi Baul, which she had assembled in an intentional effort to join Baul performers from a variety of backgrounds, lineages, and influences in West Bengal. All were excellent performers and impressive individuals. It was October, and the Bengalis wore layers of clothing along with hats and scarves in hopeless attempts to keep warm against the Chicago wind. They joined us in our student apartment for bhat-dal (rice and lentils, with dishes of fried vegetables), and they generously praised our simple meal with comments that they had missed Bengali food on their tour. Two years before, I returned from almost two years of field study among Bauls in West Bengal and Bangladesh, where I was researching lives and perspectives of Baul women. At the time of my research, I had to justify my project by arguing that there were Baul women – although they were marginalized or ignored in most literature and in Bengali’s imaginations. Bengalis debated about who was a “real” Baul, some claiming there were no real Baul woman, and others arguing that real Bauls were wandering mystics without families or possessions. Questions of authenticity and gender were intertwined. But it was October 30, 2002 when Parvathy visited, and the world was different from my fieldwork time. A year earlier, my husband and I sat watching television as the twin towers fall. We watched the news all day and night, and we stated with certainty that it marked a change in the world. Soon after, the US invaded Afghanistan. Although we knew the world was already different for many others, America has not been the same since. All the tolerance and good will we thought we were progressing toward was gone, both internationally and in our own neighborhoods and schools. People looked at each other with distrust. The gulf of misunderstanding between people grew. Hate crimes, violence, and intolerance increased. When Parvathy and Vastuvadi Baul came to Chicago in 2002, their presence was a breath of hope. Parvathy’s work uniting different people was the work of hope. Looking back, I see that my work has also shifted. I have become more focused on activism, a shift I trace back to my friendship with Bauls whose songs and everyday lives aim to create a better world. Although people will undoubtedly continue to argue about who or what is a real Baul, I recognize how Baul songs and ideology can inspire. Parvathy has not veered from her path, and she works incredibly hard for a more just world. She tours not for self-gain but with the intention of educating people about the valuable ideas in the Baul path. By singing and leading workshops, she raises money to build a center for Bauls, where they can exchange ideas, teach others, and inspire. This morning in Madison when we talked, her voice was gentle, confident, and joyful. Her strong statements were often followed by sweet laughter. Her speaking voice is as musical as her singing, and both her songs and her words transform an ordinary moment into something worth paying attention to. The printed word does not do her justice. Imagine a bubbling creek. The playful games of birds chasing each other. Imagine inner peace and self-confidence even in the face of upheaval and violence. This is the first half of the interview. Lisa Knight: The audience of Shuddhashar is broad – it includes Bangladeshis both in and outside of Bangladesh, and also people in Europe who work with exiled writers and artists, many of whom don’t know much about Bangladesh and its history. You have such valuable experiences through your Baul path, and you have also been very deliberate about bringing together different ideas and people to challenge the current situation of discrimination, so I thought you could both inform and inspire people with your ideas. So that is what I was thinking…if you are willing! Parvathy Baul: Absolutely! It is absolutely okay. Lisa Knight: I know some of your backgrounds, but for our readers, that would be a good place to start. Could you say something about your background and what inspired you to enter this Baul path? Parvathy Baul: I was born into a family that came from Bangladesh, and my father and mother came from Chittagong. So most of their studies were in Bangladesh. My father’s studies started in Bangladesh, but then he studied engineering in Kolkata. My grandfather did not come to India until the Bangladesh war, which was after independence when they were separating from Pakistan. He did not consciously come to India, but my father did not let him return to Bangladesh because of the danger there. My grandmother was part of the Surya Sen freedom struggle. [Surya Sen (1894-1934) was a school teacher and a revolutionary who organized youth in the liberation movement against British colonialism. He led a raid on the British Cantonment in the Chittagong mountains and made other attempts to liberate Chittagong from British rule. He was later hanged by the British. ]They were a respected family in the area of Chittagong. They also had two temples in that village: one was a Shiva temple and the other was Kali temple. It was a special community that is known as Pariyal. This Pariyal clan is still there in Chittagong because I have gone back – in 2014, I went back to meet my people. Lisa Knight: Are the temples still there? Parvathy Baul: Yes. I went there in a very special time. My grandfather left the house and everything locked – he did not transfer anything. [He left his home in Bangladesh around 1971.] So even now he had the tea import from Burma, and that storage house is still locked, and the key he took when he left for India [expecting to return soon]. It was all still there when I went in 2014. Lisa Knight: And no one tried to break in to take things? Parvathy Baul: No! because people loved him, everybody loved him, and he was a kind of leader for them. Lisa Knight: There are many stories about people breaking in and taking things from those who left for India during Bangladesh’s war of independence. Parvathy Baul: No, because this was a kind of community. And the land and the temple is also protected by the community. But they slowly found out that it belonged to satrusampatti– the “enemy property” – because we are enemies [laughs]…we are Hindus. So, they wanted to occupy the temple, but it is actually at that time I went back to the community. So I got my father’s right, and I said the property was in our family, and we would be happy if the community takes it over. So that is how it was handed over to them. That was in 2014. I come from a family that had no relationship with Bauls because Chittagong is not really a Baul area. I came to know about the Baul path when I came to Santiniketan to study. I did not come to Santiniketan to learn Baul – I went to study at Tagore’s university. But I happened to meet Bauls there, I met Phulmala-di, I met Sanatan-baba. My first encounter with Bauls was in the train when we were going there – I think most of us have had that experience [LK laughs, yes…]. It was this local train, and it was evening time, and this one blind Baul comes into the compartment, and he had this tin ektara [a one-string drone instrument]made of this Amul tin [a homemade instrument made from an Amul milk can]. The moment he strummed the ektara could relate to the sound…it immediately took me to another place. I knew that I understood this sound very well. And when he sang, I felt someone was calling me from very far, and I knew that if I heard Baul songs one more time, I would become a Baul. So, I started avoiding Bauls so I could concentrate on my studies. But in Santiniketan, there is no escape! My first art assignment was to make sketches of the Baul masters and go to the akhara, so of course, I happened to meet many Baul masters. I then became totally immersed in Baul songs. I wanted to learn properly, so I went to Phulmala-di because Phulmala-di’s voice and songs impressed me a lot. She inspired me. Her songs are so simple and so sweet, and I also felt a very good connection with her as a person. So, I used to study with her, but she was very demanding of me as well. She would say, “You have to come with me to the train, you have to beg, otherwise I am not going to teach you.” So, I started going on the train, and in the university, it became a very big problem because as a student I was going on the train and begging with a Baul. Finally, my studentship was canceled; I was thrown out of the university. But I remained with the Bauls [laughs]– exactly what I thought would happen when I first heard the Baul songs! After a year, Phulmala-di told me I had to go deeper into the Baul sadhana [practices; discipline], and I needed a guru because singing alone wasn’t enough. I told Phulmala-di, “You become my guru!” But she said that she did not have the authority. She was initiated into the Baul community, but she did not have the authority to become a guru and initiate others. So she said I would need to find someone who has the authority of the Baul sampradaya because it is a lineage. Someone who initiates has to have received permission from their guru that she or he is ready to initiate others. So I happened upon Sanatan-baba, and I spent 25 years with him. He left his body in 2015. After seven years with him, I met Shashanko Goshai, who became my siksha guru, because you know Bauls have diksha guru, siksha guru. I spent three years with my siksha guru in Murshidabad because when I met him, he was 97, and he had his samadhi when he was 100-years old. And then again I went back to Sanatan-baba and continued my path. In 2008 I was given purna diksha, which is called bhek bairagya, and Baba made me the next teacher for the lineage – as a lineage holder to initiate people and to teach the Baul path to others. Then he told me that I needed to create a place where all the different schools of Bauls can come together, almost like archiving the teachings and bringing – not really intruding to make them one but keeping the diversity – but bringing all the sadhana together because Baba said it was difficult for Bauls to sustain through all these social changes. That includes Bangladesh as well because in Bangladesh many of the practices are lost or are threatened. So this space near Kopai [named Sanatan Siddhashram], it is a space for no boundaries – it is for Bauls from both sides of Bengal, and it is inclusive of Fakir, Baul, Tantric, Vaishnava – any practice, inclusive of anyone. We are willing to support old masters with health issues. So I’m trying to build this. This is my current work. I am in service because I have received so much from the Baul tradition that I feel it is my time to work for them and to do something that will remain even after my time. We did not have a center for Bauls, but maybe now it’s important to have a center. So that is my current work, and that is what led me here. I’m going around the world singing Baul songs, telling the meaning of the songs, and making people interested in the tradition and to contribute with their good will. Lisa Knight: I appreciate your idea of supporting the diversity of the Baul path because there are so many different ways, and it is tempting to try to put them all together and make them into one path. But you lose so much creativity that way, so much potential inspiration if you ignore the diversity. 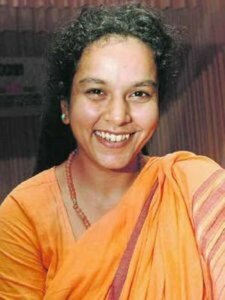 Parvathy Baul: No, that would be a big mistake if we did that. And many people have tried to mix things up and join them all together into one. But after some time, it became monotonous, and there was no way forward because it is the diversity that makes us grow. Lisa Knight: Have you had much support from the different communities? Parvathy Baul: Yes. I have had great support from different masters. In fact, after I leave here, I am going to Bangladesh, to Kushtiya, to meet the old fakir masters and talk with them and get them to come to Gurukul and share their experiences. I have very strong support from all the Baul masters – elder generation and younger – because they feel that it is essential to be recognized as a practicing path and not only as a musical tradition. It is a spiritual path that has so much philosophy inside. But I don’t think everybody understands me. The very intellectual Bengali society, those who have worked with Bauls in a certain way, they don’t really see the point in my work. They think I am trying to intrude over all the schools; they don’t see that I am trying to keep the diversity. Intellectual people who don’t really know about the Baul community but think that they know – sorry! I am being very rude! [we both laugh; LK: No, no, I know what you mean. Many people have very strong opinions about Bauls!]. They don’t understand what I am trying to do. But those who are practicing Bauls and leading the Baul path, they understand this work because I am living and following the same path with them. I know what is essential right now. I feel the urgency of having this space. And they feel this urgency too. Lisa Knight: I’m inspired by what you’re saying. This sense of community is what the Baul community used to have, when people used to come together and talk about different ideas from across the border, from different backgrounds. I would read about fakirs and Bauls from different backgrounds knowing something about the Qur’an or the Bhagavad Gita and being able to share their interpretations and the religious symbols that they would use in their philosophy and songs. You sing about many of these different traditions also, and certainly, in Bangladesh, some do as well. But that opportunity for that kind of mixing, debate or discussion, and opportunity to inspire each other is not so present now. Parvathy Baul: Yeah, it’s not really present anymore. The attention is too focused on music. I mean music is beautiful, but one also has to create songs, and for that one has to know the discipline of the path and to share the practice. Nobody shares the sadhana; everybody shares songs. But in the old times, you’d see they shared sadhana through the songs; it was not the only song. We have to go back to that. Like sometimes it is said in the tradition that when you are lost, you must return to the first day you sat with your guru. What first inspired you….if you are doubting anything, immerse yourself in that first day. Lisa Knight: That is a nice image! Why do we start something? What was the first inspiration? It is a good way to re-center yourself and set your priorities. Parvathy Baul: We have to re-center ourselves and have confidence as well. As you have seen, people are too fragile. I think the recognition [in oneself, one’s inner truth]will bring confidence in all their actions. Lisa Knight: I think people have a responsibility of inspiring others who are lost and caught up in problems and distractions in society. Baul songs – you listen to them on the train and they take you somewhere else. Humans need that anyway, but they really need it now. Parvathy Baul: Yeah, yeah. It’s more and more relevant today, the practice of the path. Lisa Knight: What are some of your greatest realizations about humanity, society, or our relationship as humans to each other? Parvathy Baul: It is very simple, actually. I don’t have much to say about it. It’s very simple: to cultivate acceptance of the other and to be able to receive them as they are, to cultivate this compassion inside, which is very strong and which can hold [together]our differences. What people want – all of us – is nothing much. We just want a little acceptance, a little bit of love and respect, for whatever we do or how we live. And if we are able to give that compassion and respect to each other, I think we will have less war and corruption. I mean, it is very simple, and I don’t have to say much. It is a little acceptance of each other. Lisa Knight: How do we get there? Parvathy Baul: That’s very hard. Because the ego is in the way. When people do not have a spiritual path and way of growing, they do not see that there is a higher truth. They need to be a little bit detached from all things, and not think of themselves as the center of the world, and to give a little space to others. If they can learn their inner truth and decrease their ego, then maybe the trauma that we all carry from life will decrease. Because many of our actions come from the trauma that we have faced in life. Even big decisions, which affect many, many people in the world, come from the trauma of someone’s life, their insecurities. If one works on the individual self, the self that is within us, and on our fears and insecurities, I think we will do better for others. Bauls always talk about this. Baul always says to look for maner manush [inner self]to see maner manushi n everyone. So, if you go to Baul akhara, you see that if one person comes from high society or from a very poor community, it does not matter: everybody is equally received, fed, and looked after with the same warmth and love. Bauls do not have boundaries. That is our path, that is our practice. This is a little thing we understand about humanity. **See Issue 12, February 2019 for the second half of interview with Parvathy Baul.